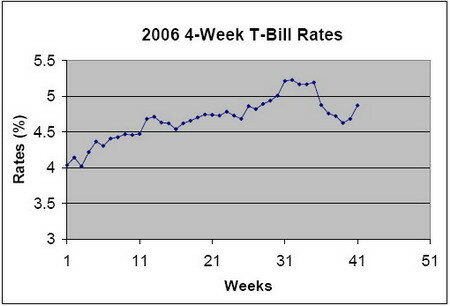 After reaching a low of 4.624% on September 28th, the rate of the 4-week T-Bill has rebounded a little bit, with the most recent auction on October 10th resulted in a 4.87% APY. While the rate is still lower than what some popular online savings accounts (such as EmigrantDirect and HSBCDirect) currently offer, buying 4-week T-Bill makes sense if you live in a state that has high income taxes as interests earned from T-Bills are exempted from state income tax. To see what your equivalent APY is, use this calculator at MyMoneyBlog.